A travel nightmare will unfold this week as odds increase that a highly disruptive snowstorm will affect the Mid-Atlantic and Northeast on Wednesday. Travel through all major cities from Washington D.C. to Boston will be heavily affected by this impending snowfall. 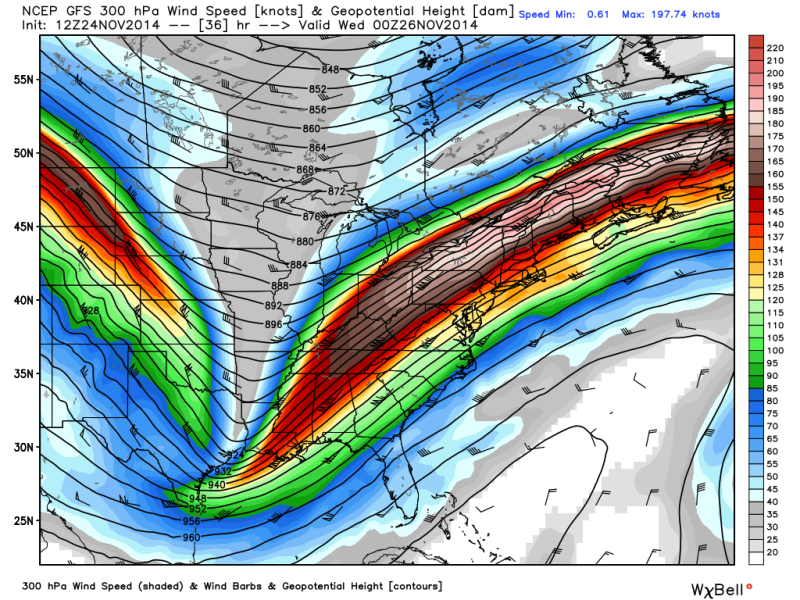 A trough in the jet stream is making its way towards the East Coast from the central Plains this morning, and it should get close enough to start messing with our weather by Wednesday. A developing low pressure system in the Gulf of Mexico will get kicked northeast by the approaching trough; the combined influence of the trough and upper-level divergence from the jet stream itself will provide optimal conditions for the low pressure system to quickly develop and strengthen as it tracks up the East Coast. —Where will the worst happen? Basically, the little details that matter are the ones we're still somewhat unsure of at this point. What don't the forecasters know? Often in situations like this, the most important aspect of a weather forecast isn't what we know, but rather what we don't know. The two biggest factors that will have a dramatic impact on who sees how much of what and when is track and temperature...and what are we unsure about at the moment? Track and temperature. Out to sea, out of mind. When a coastal storm goes out to sea, it very rarely affects land and nobody but Bermuda and some ships have to worry about it. This is very unlikely to happen with this storm. Some coastal storms wind up riding directly over the shoreline or a dozen or two miles inland. These storms often produce snow for the Appalachian Mountains and inland areas, while drenching the I-95 corridor in a cold, miserable rain. As these storms pull north and away from the megalopolis, cold air can wrap around and precipitation will often end as a small burst of snow. Coastal lows that move parallel to the coast while staying a few dozen miles offshore are the "ideal" storms that produce blockbuster snows along the all-important I-95 corridor. These are the storms that shut down school for a few days and make people lose their ever-loving minds. There is one big caveat: if the low forms too far away from the coast, the precipitation shield could stay far enough offshore that it only affects coastal communities while sparing the heavily-populated areas. LIKELY SCENARIO: A mix between B and C right now. The low will ride up the coast, but two dozen miles to the west or to the east is the difference between travel headaches and travel hell. Air temperatures through the bottom few thousand feet of the atmosphere are crucial when it comes to winter weather. If temperatures are too warm in that shallow layer above ground level, forget about it. 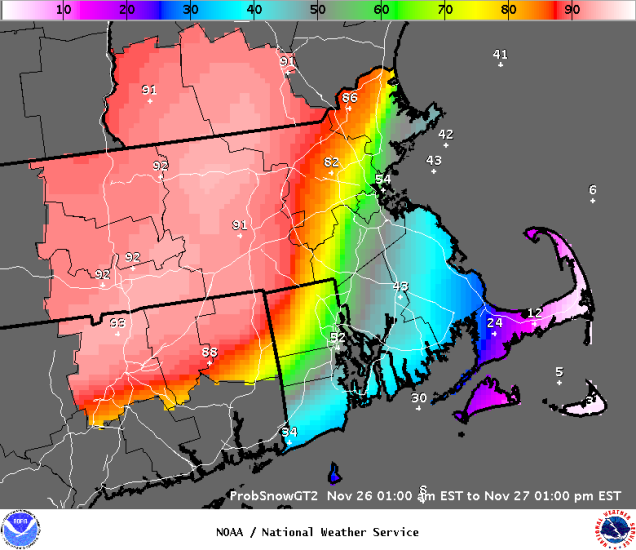 The question of temperatures boils down to "where will the rain/snow line set up?" Temperatures will be closely associated with the track of the low—if the low tracks too close to shore or even inland, warmer temperatures will follow and precipitation will be almost all rain for the major cities. If the low tracks further away from land, it can drag colder temperatures in closer to I-95, shifting the rain/snow line closer to the coast. A wobbly track could mean the precipitation starts as snow, changes to rain, then changes back to snow. The weather models are all in agreement that 1) a strengthening storm will traverse the East Coast on Wednesday, and 2) precipitation will begin Tuesday night in the southeast and spread through the Mid-Atlantic and Northeast by Wednesday. As we get closer to the event, models generally agree that the major cities will see at least some form of snowfall. The GFS (American) model shows the storm affecting the southeastern United States on Tuesday night into Wednesday morning as all rain. The precipitation begins to encroach on the Mid-Atlantic before sunrise on Wednesday as mostly rain, before quickly changing over to snow during the mid-morning hours. The model sends the low right up that "sweet spot" track that brings snow to the entire I-95 corridor, save for rain right on the coast. The model shows the possibility of two to five inches of snow from central Virginia through the New York City metro area, with more from Connecticut up through Maine. Then there's the GFS parallel upgrade, which is an improvement that runs parallel to the old model. If the GFS model is Coke, then the GFS upgrade is Diet Coke. Similar name, different taste. It shows almost the exact same scenario as the old GFS. Here's a snap of the Old GFS at 54 hours, which is 1:00 PM Wednesday. The image shows mean sea level pressure (contours) with precipitation type (green/rain, blue/snow). If you look closely, there are thin blue and red contours over land. The blue contour is the 35°F line, and the red contour is the 32°F line. 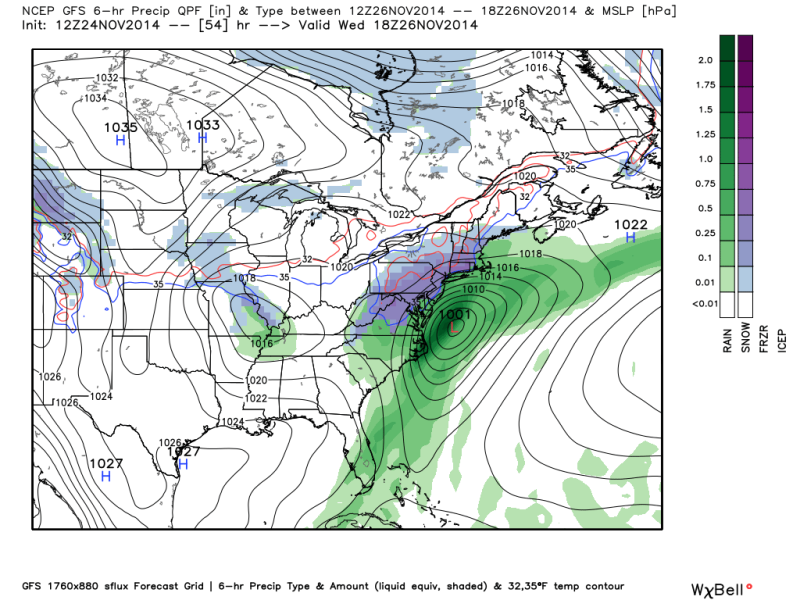 The European model has been the most bullish about the snowstorm, showing the potential for at least a week now. The Euro tries to paint a major snowstorm with double-digit snowfall totals from the mountains of North Carolina straight northeast through Atlantic Canada. I think these snowfall totals are way overdone given the mediocre temperatures at the surface. Even the NAM (North American Model) shows a modest blanket of snow falling from Charlottesville, Virginia northeast through all of the major cities. The big question. 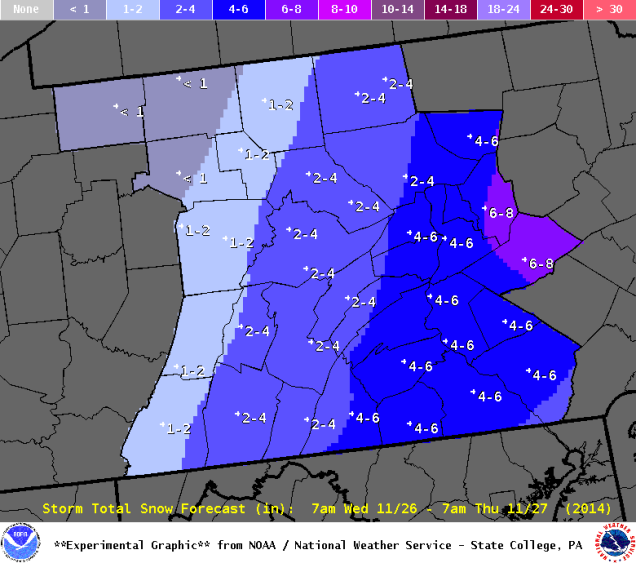 Let's look at the snowfall accumulation probabilities from the Weather Prediction Center. 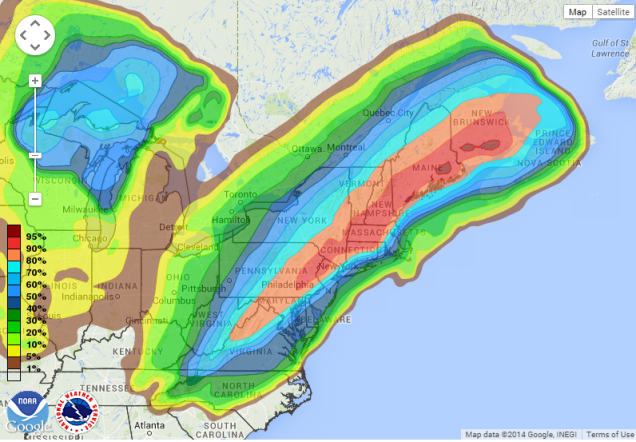 The following image shows the chances of four or more inches of snow accumulating during the storm. The red contour shows a high risk (70% chance) of at least four inches of snow—the WPC's latest thinking is that the worst snow will occur west of I-95. The big problem right now are forecast temperatures during the snowfall event. You can't have a major snowstorm with surface temperatures sitting at 34°F. If you take a quick look at the images from the two GFS models I posted above, you'll see that almost nobody but the mountains and central Pennsylvania are at or below freezing during the snowstorm. That's a HUGE problem with regard to accumulations. Going region-by-region is the easiest way to cover the potential impact from Wednesday's storm, and it's worth noting that this all assumes that the European Model is stoned and producing snowfall totals far too high given surface temperatures mostly above freezing. Keep in mind that a small east or west deviation in the actual track of the low pressure system means the world in these situations. All snowfall accumulations and maps shown below are directly from the area's respective National Weather Service office. BEST CASE SCENARIO: In the cities proper, rain mixed in with conversational snow at the end. 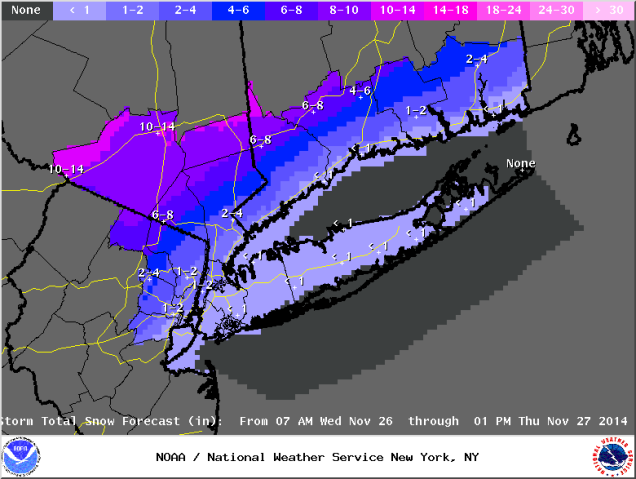 West of the cities, the best case scenario is less snow that what NWS Sterling predicts as shown by the map above. WORST CASE SCENARIO: In the cities proper, mostly snow, and up to five inches of it. West of the cities, more snow than shown on the map above. 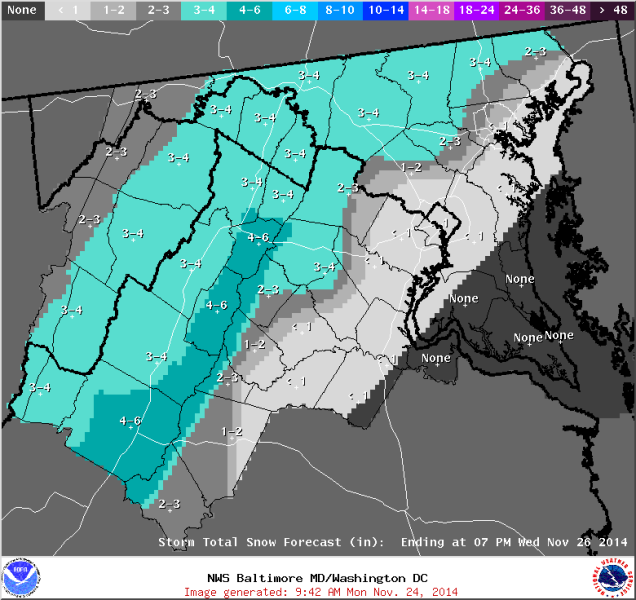 The best odds of accumulating snow in the D.C. area are, as usual, north and west of town. BEST CASE SCENARIO: Same as Washington D.C. WORST CASE SCENARIO: Rain quickly changing over to snow, with up to three inches possible. The NWS office in Mount Holly, New Jersey did not produce a snowfall totals map (sorry! ), but they say that the most likely scenario (as of 7:00 AM) is an inch of snow in Philly and Wilmington, Delaware, with much more as you head into central Pennsylvania. BEST CASE SCENARIO: The low moves too far to the east (or rain holds on longer than forecast), cutting snowfall accumulation down below what NWS State College forecasts above. WORST CASE SCENARIO: Tack on a few more inches to the predicted accumulations seen above. BEST CASE SCENARIO: All rain. WORST CASE SCENARIO: A couple of inches of snow after the rain changes over. It's worth noting that this is for New York City proper. A winter storm watch is in effect for northern New Jersey, a good chunk of southeastern New York, most of Connecticut outside of coastal communities, and western Massachusetts. The watch advises of the potential for 6-10 inches of snow, but the NWS office on Long Island warns that there will be a very sharp gradient between warning-level snow and a slushy inch. They think NYC proper will be on the "slushy inch" side of the rain/snow line, but any shift in the track could change this in a hurry. BEST CASE SCENARIO: Not as much snow as shown the map above. 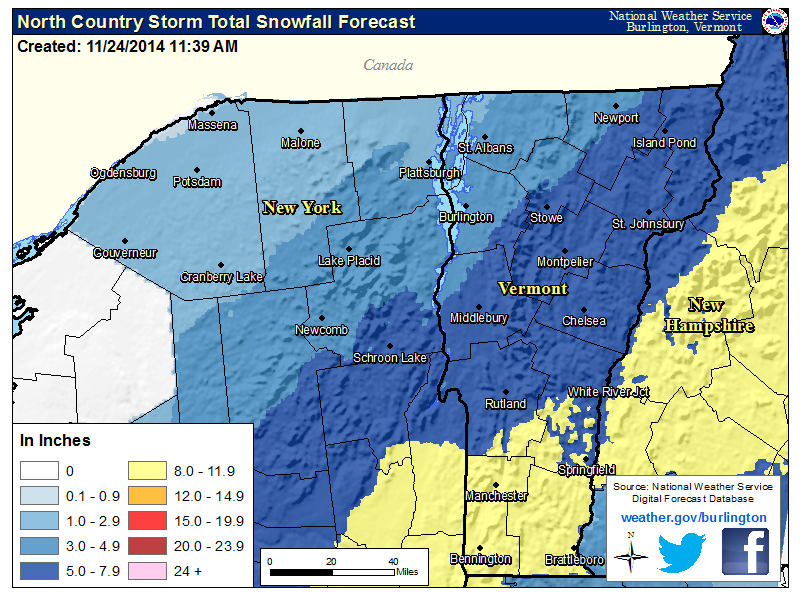 WORST CASE SCENARIO: The amount of snow NWS Albany is forecasting, shown on the map above. BEST CASE SCENARIO: All rain in Boston proper with some snow at the end; negligible accumulation. Less than four inches in central Mass., southern New Hampshire, northern Connecticut. WORST CASE SCENARIO: Shovelable snow in Boston proper. Close to double-digits in central Mass., southern New Hampshire, northern Connecticut. BEST CASE SCENARIO: The storm moves east and shirks the area out of significant snowfall. 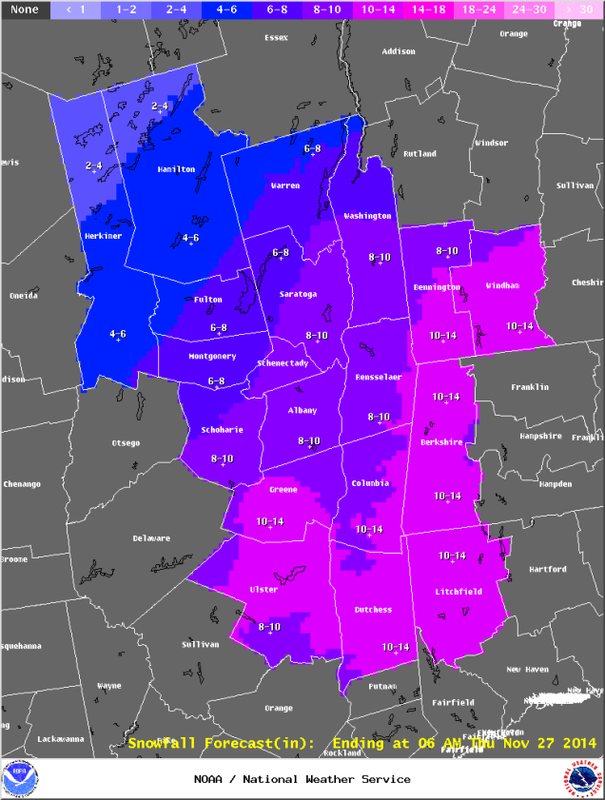 WORST CASE SCENARIO: Again, tack on a few inches to the above snowfall forecast from NWS Burlington, who wins the prize for the prettiest maps. Neither of the NWS offices that cover Maine have produced snowfall maps yet, as each office waits until they issue winter storm watches/warnings to produce their forecast maps. However, if you live in Maine, you can extrapolate the maps from neighboring offices to figure out what you'll get. Most of populated Maine will see shovleable snowfall. 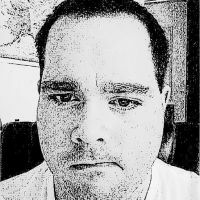 What do I need to know if I'm traveling? 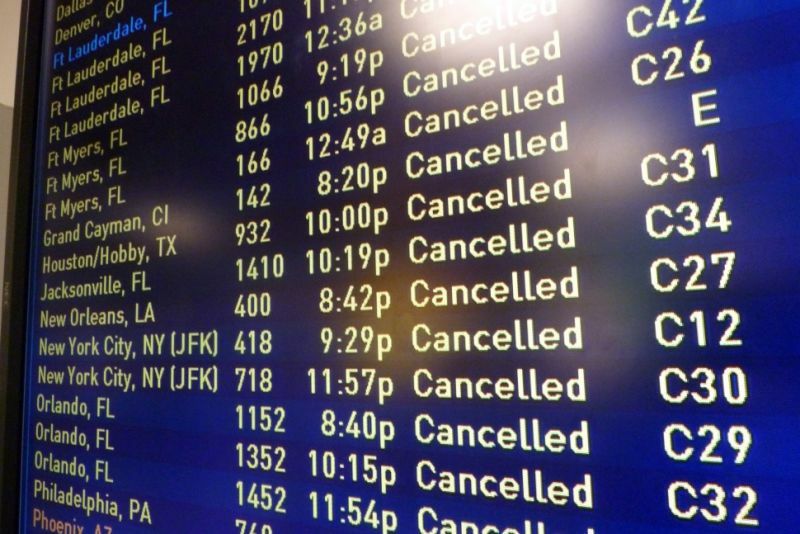 If you're flying on Wednesday or any day through the weekend, be prepared for enormous delays or cancellations. Even if you're not flying through the cities affected, your plane might be routed through the region seeing snowfall. Cancellations and delays have a ripple effect through the system. If you're driving, be prepared to stay home or have to take an alternate route to get to grandma's house. The sheer number of holiday travelers makes driving a mess as it is, but mix in snow on the roads with people who refuse to stay home, and we're likely going to see pileups on major highways. It will get ugly. Keep in mind that rail travel is also affected by wintry weather if a certain amount of snow accumulates on the tracks. Just as if you were flying, be prepared for delays or cancellations and make sure you plan an alternative. 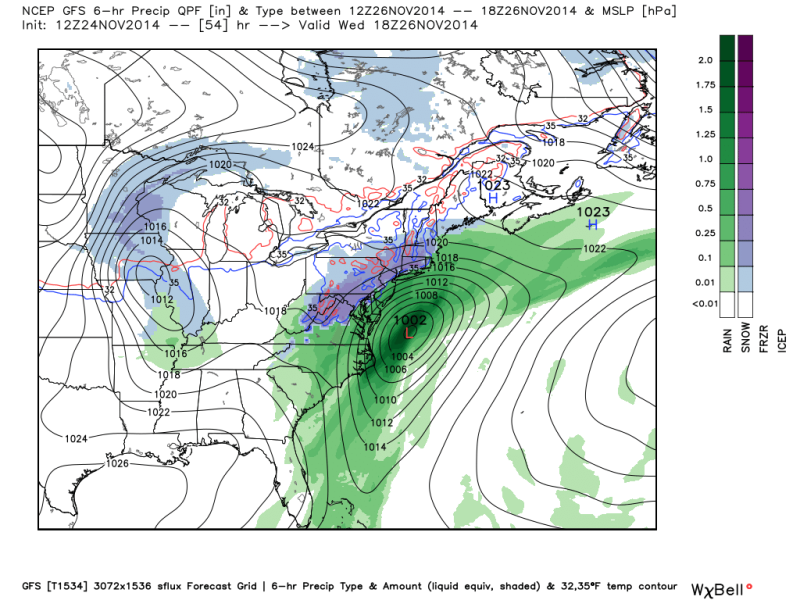 If it comes to fruition, this storm will be one that we talk about for years to come. It has the chance to make a mess of holiday travel and cause a headache on the busiest travel day of the year unlike any we've seen in decades. If you're traveling through the areas forecast to see snow, be prepared to stay home or eat airport food for longer than you'd like. As more model runs come in and Wednesday draws closer, forecasters will continue to tweak their forecasts to account for changes. Keep checking your forecast, and make sure you're prepared for the first snowstorm of the year.